What are the home-schooling laws in your state? Some states require the home-schooling parent to have a level of education. How will you arrange to meet your child's socialization needs? Does she have opportunities to play and learn with other children in the neighborhood, in a scout group, at church, etc.? 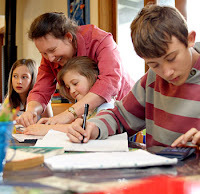 How does your spouse feel about home-schooling? It can be very difficult to home-school on a long-term basis without approval and support from your child's other parent. Can you afford it? The decision to home-school results in limited income potential for the primary home-schooling parent. Another part of the decision-making process would be to look at the pros and cons of home-schooling. If you have had frequent power-struggles to get your child to do homework when she was in public school, you need to be prepared for those struggles as a home-schooler. Know that public school teachers may have a better education than you do. You may simply be unprepared to be the “go-to” person for everything under the sun. Thus, you must be willing to do the research if a question can't be answered on the spot. Not being able to learn with peers, and not being able to associate and congregate with other students the same age can lead to some developmental problems in your child. The cost of homeschooling can start to come into play when you purchase textbooks and teaching materials. Further costs come into play when you consider the opportunity cost of a parent staying home, and not bringing in a second income for the family. There will likely be a lot of frustration coming from your youngster when you are covering hard subjects. When she gets flustered, you can't allow yourself to do the same. You must be able to separate at times the role of parent and educator. Understand that you will be teaching year-round, and that it really is going to be a full-time job. Thus, you will need to treat it like one, and not like a free pass from getting a public paid job. You may need to spend some time with a particular subject so you can get to the point where you can “teach” that subject. RE: "Should I do it?" Are you frustrated with the school system? Are you seeing your daughter’s love for learning starting to wane? Do you and your daughter spend more than 90 minutes a day on homework? Do you enjoy adding creativity and fun to your daughter’s day, but find that creativity had to stop once she started heading off to school? Do you have a daughter who is exceptionally bright? Is she currently bored in school? Is she struggling in school? Do you want to instill faith and values into your daughter? Do you (or will you) work less than 20 hours per week outside the home? Has your daughter become discouraged and/or started calling himself dumb? Have you lost the ability to be spontaneous due to tight schedules? Would you like to have more control over your daughter’s education? If you answered “yes” to most of the above, then home-schooling is likely to be a good option for you and your child. Before taking the leap into the world of homeschooling, be sure to pick the brains of a few parents who are currently doing it. Inquire about what they found that works – and what didn’t. What were some of the early mistakes they made, and how can you avoid making those same mistakes? How about cost? Make a list of questions and get the advice from at least three other home-schoolers before making your decision. Many of the members of our support group home-school their children. I'm sure they would be happy to offer some advice to those parents who are considering going this route. CLICK HERE to join. • Anonymous said… Christian doctrine may well lead her to a life of love, compassion, hope, faith and the fullness of life. Lord Jesus we trust in you! • Anonymous said… I enrolled my hfa son in virtual school. In our state it's a free public option. I couldn't stomach the idea of him attended public middle school. The bullying was already bad. He graduated South Carolina Connections Academy high school with honors. I was very happy with it. I do wish I had been able to get him more social interaction but it was way more interacting than he wanted so I'll take it. He took a year off to focus on his personal growth and will start college this summer. • Anonymous said… I started homeschooling my then 6 year old hfa son midway through 1st grade in a public school. He was absolutely miserable with the sensory overload and was being bullied (in 1st grade!) He was also beginning to get in trouble a lot in school for "defiance" and meltdowns. I have beem homeschooling him using an online program for the past year and he has never been happier and more interested in learning. At first I tried a more traditional workbooks and written lessons. That did not work at all for him. It was a bit of a rocky start at first, but once we got into a routine of the online learning he has really been thriving. I do hope to mainstream him back into school through a partial homeschool/charter school option next year. I also send him to extracurricular STEM school classes and he loves it and gets to interact with other kids who have similar interests (because I do worry about lack of social interaction). It was a tough decision to make at first and I am sure what is right for one child may not be for another, but it has really been a positive thing for my son. • Anonymous said… IF I could afford a private school, I would do so, in a heartbeat. I know I'm not equipped , in any way, to effectively homeschool . • Anonymous said… Is a Charter School an option? • Anonymous said… is a free online homeschooling website that I use for my daughter, who has Aspergers, & I highly recommend it, as she's learning more now than ever! • Anonymous said… It is online school with certified teachers and curriculum provided by an accredited school but administered at home with a parent learning coach. Here is the link to the one my son attended. • Anonymous said… Our hfa is enrolled in AZVA. A virtual public school. Her grades have improved sooo much! We are lucky hete to have a brick and mortar building option also and there are only 10 pupils in her classroom. • Anonymous said… Same situation here. I pulled him out last September and have seen nothing but gains and progress. Do it if you can! And don't doubt your ability to do it. There is so much support and help out there. This can work! • Anonymous said… We have done cyber charter school for 8th and 9th grade and it has been a good alternative to the regular school. He goes to a social skills group to get some interaction with peers. • Anonymous said… We've homeschooled, (my 11 year old Aspie and her younger brother 8) since the beginning. It's hard work, but I know its been the best thing for all of us. She wouldn't have it any other way. A bonus is that she is pretty close with her younger brother because they spend school days together, a regular phenomenon of homeschooling, and I think they learn a lot from each other. • Anonymous said… What exactly is virtual school, and how does it work. I've heard of it before, but when I Googled it, the results were extremely overwhelming.